A secure donation box (emptied daily) is also provided at the Lighthouse, Brown’s Beach and Ancient Cedars trailheads. 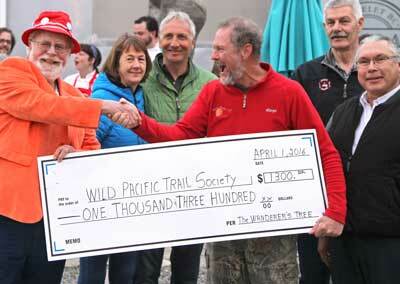 The Wild Pacific Trail Society is a registered non-profit organization. Tax receipts issued upon request for donations over $25. Please contact us if you wish to become a sponsor. Thank you to all our generous funders: the Clayoquot Biosphere Trust, Island Coastal Economic Trust, the Creek Bed Foundation via Tides Canada, the National Trails Coalition, the Government of B.C., the District of Ucluelet, the Wild Pacific Trail Society and private land owners such as Ocean West. The Wild Pacific Trail began in 1999, with contributions from the Government of Canada, Western Economic Diversification Canada, Community Futures Development Corp., Interfor, and Weyerhaeuser Co. Ltd.
Special thanks to the many local businesses and individuals who have generously volunteered time and materials to make this trail a reality. Ongoing support from west coast communities and visitors who enjoy this trail will ensure the completion of this outstanding project. 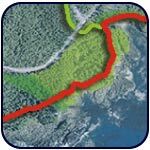 This trail would not be possible without the support of the District of Ucluelet, private landowners, Ucluelet First Nations, Provincial & Federal governments. Donation from Raven Lady food cart, Wilderness Tree sculpture fundraiser. WPTS Vision: To inspire a personal connection with nature to create a wave of change for environmental stewardship. ▪ To promote and protect a spectacular coastal trail network, where the temperate rainforest meets the ocean, that is accessible to everyone and showcases the natural and cultural treasures of the Ucluth Peninsula. ▪ To inspire people through sharing perspectives about the culture, history and nature of this area. If you’ve read Oyster Jim’s Story: Birth of a Famous Trail you know how far this dream has come. 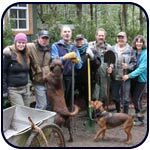 Donations have built this dream every step of the way, we need your help to keep it going!’ Please help the Wild Pacific Trail Society enhance this incredible coastal hiking experience and preserve the surrounding rainforest for many generations to come. “There’s some fabulous opportunities for trail building through the lands going out to Half Moon Bay,” said Oyster Jim. Since its opening in 1999, 5 out of 7 phases have been completed with the trail stretching 9 of the proposed 14 kms from Amphitrite Lighthouse towards Half Moon Bay, where it will someday connect with Pacific Rim National Park trails. Imagine a multi-day hiking trail along the coast! Funds can also be targeted toward new trail sections, repairs or interpretive signage. Donations over $1,000 receive a plaque on our funders’ sign at the main trailhead. Recently we were humbled by donors who gave generously after extreme storm damage decks and bridges on sections of trail. Thank you very much, we could not exist without your support. 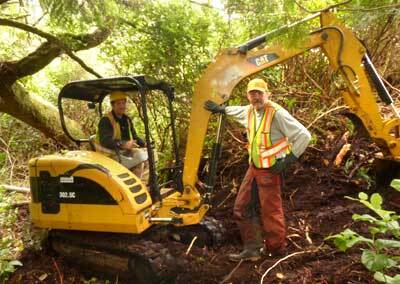 Help preserve the trail and protect its surrounding fragile ecosystem of old-growth coastal rainforest. Contribute as a visionary sponsor towards the creation of a wilderness parkland via purchase of a 13-acre parcel currently zoned for resort development. This Greenspace Campaign envisions a partnership with an educational facility in a corner of this property that is already set up with road access. “I’m still hoping and dreaming that we will have an angel come and visit us who understands the value of a 5 million dollar investment in nature and the legacy that will provide,” said Oyster Jim. Benches can be sponsored as a memorial or charitable donation. Sponsors are given a dedication plaque on the bench. For details contact info@wildpacifictrail.com. Businesses listed here have supported trail society projects or network on our behalf. Special donations have also been received from Telus, Ukee Cable Services and the Raven Lady Food Cart. Businesses such as Black Rock Resort and Water's Edge Resort also sell trail society merchandise and donate the full proceeds.